Title: The emergence and development of gene expression profiling: a key component of the 3B (bench, bedside, bytes) in translational research. This paper (which can be downloaded in french) examines the emergence and development of one of the key components of genomics, namely gene expression profiling. It does so by resorting to computer-based methods to analyze and visualize networks of scientific publications. Our results show the central role played by oncology in this domain, insofar as the initial proof-of-principle articles based on a plant model organism have quickly led to the demonstration of the value of these techniques in blood cancers and to applications in the field of solid tumors, and in particular breast cancer. The article also outlines the essential role played by novel bioinformatics and biostatistical tools in the development of the domain. These computational disciplines thus qualify as one of the three corners (in addition to the laboratory and the clinic) of the translational research triangle. 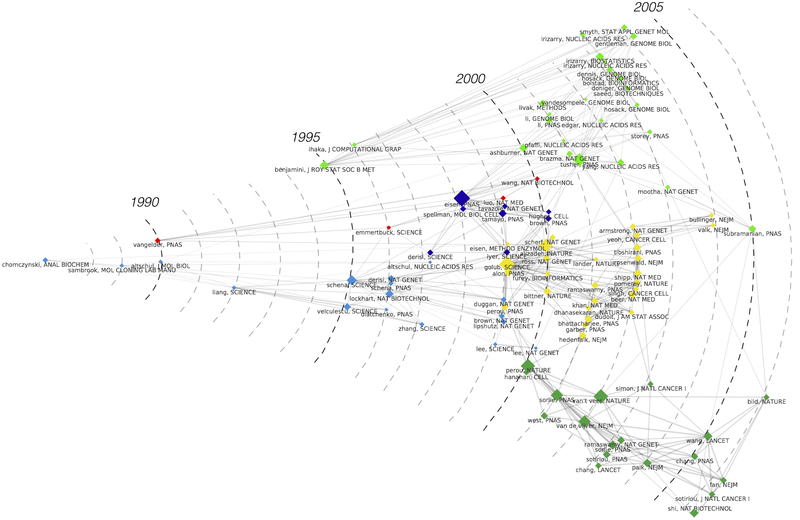 An original mapping visualization technics is introduced in this paper: radar maps, which encapsulate relations (co-citation links) between references and plot them according to their publication date, mixing classical network spatialization tools with the classical timeline representation.